Found 43 entries in 0.104 seconds. How much of your own books were you consciously looking at books like Jordan and saying, "I like that kind of world," and trying to create that kind of world in your own stuff? I spent most of my early career, as I kind of implied earlier, reacting against books that I had really liked. The main purpose for this being that I felt that Robert Jordan and various other authors really covered that type of story and that type of world really well. And so I said, "Well, what other room is there to explore?" And so you see me reacting against. For instance, Mistborn is a direct reaction to the Wheel of Time. Mistborn began as the question, "What if Rand were to fail?" That's what spun me into creating that entire book series: what if the prophesied hero were not able to accomplish what they were supposed to accomplish? And that became the foundation of that book series. So you can see where I was going and things like that. A lot of times I will read something, and if it's done very well I'll react against it, and if it’s done very poorly then I’ll say, "Oh, I want to try and do this the right way". And both of those are kind of an interesting style of reaction to storytelling. So I would say I was deeply influenced, but it's more in the realm of, "Hey what have they done? What have they covered really well, and where can I go to explore new ground?" How long did it take for you to complete the Mistborn trilogy? I wrote the entire trilogy, straight through, starting in the beginning of 2003 and ending in early 2006. He commented that he thinks it is a mistake to have Vin burn the mist in the end of Mistborn 1, because it feels too much like a deus ex machina. That, confusing tin with silver, and confusing clubs with another character are the three mistakes he think he's made there. Nothing really new, but some may not have heard of that. In the Mistborn trilogy, was it hard to write the final twist, or had it been planned that way? This is always the way it was planned. There are some smaller things that I'll allow spontaneity to change the book, but the general structure of the book is always planned out. And if something changes while I'm writing I go and throw away the plan and rebuild the plan, so I'm always writing with a plan. Well, Mistborn-- I passed, honestly, through a fog bank at 70 mph driving from my mom's house, and I'm like, "This looks cool, I've got to use this." That's the first thought I can think of. Feruchemy goes back to being in high school and being an insomniac, being really tired and wishing I could store up my sleep, so I'd be sleepy when I wanted to be sleepy. Kelsier's inspiration was a guy who had been only out for himself, who realized the greater import of doing something. Languages. So languages in my books, I have a couple of tools that I use and it depends on the book. For some books I just use kind of shortcuts. Mistborn is an example of this, there's only one language that everyone is speaking and there is a little bit of Terris, so for that I just made every region-- I based off of an Earth language and used that. Like for instance the Central Dominance is French, so Vin and Demoux--and they would say Kelsi-ay--and things like this is where the names came from. For something more intricate like Stormlight Archive, I did take linguistics classes, I only snuck into a few of those. And so I'm able to drill down and do some real linguistics. And so I know what I want things to sound like, I know how I want them to feel. And I have all sorts of goofy things that you would even need to know, like for instance they would say "Kholin" instead of Kholin and stuff like this because there's a little bit of Semitic, the language family I'm using as a basis. And then there's stuff like the symmetrical names and stuff like that. Anyway, I can talk about that forever but the answer is yes I find what's cool but sometimes it's really academically cool and sometimes it really puts people of. Like one of the first reviews I got from Elantris was like "These names are really hard to pronounce and kind of dumb" and this was like one of the major review magazines "I can't get into these names" because I had used lots of linguistic things from my time living in Korea to create the languages, and they were kind of hard to say. It's part of why in Mistborn everyone has a nickname that's easy to remember. What are my parting thoughts on this series? Well, honestly, they're "Damn, that turned out well." It was my first series. I began the first book the year I sold Elantris, back before I'd met my wife. I'm writing these annotations in December of 2007, with my first child being about a month old. Mistborn has dominated my life for some four years. I love these characters. I am thrilled with how the world turned out. And the plot . . . well, it just all worked out even better than I'd hoped. I worry about being able to top this—but then, I always worry about that. A book is a window into the author's soul, and there was a lot of soul-searching in these books. My thoughts and fears about leadership, religion, relationships, and the nature of truth all show up in the interactions of the characters. These books are part of me. But now they're part of you too. Thank you so much for reading. The title of this section of the book is "The Legacy of the Survivor." If I recall correctly, part one of the first book was "The Survivor of Hathsin" and part one of book two was "The Heir of the Survivor." Kelsier still overshadows these books. In this chapter particularly, I wanted to show an entire group of people doing essentially what he did in book one. Just as Kelsier faced down an Inquisitor, this band of soldiers is going to charge an army of koloss. One of the things I wanted to do with these books was to slowly transform characters so that their weaknesses became strengths. It's an odd little theme, hardly visible, I think–and not really that important. However, it's there. Vin is learning to be a scholar, despite how much she protests and fights against the transformation. I've expressed that my one regret with Mistborn is the climax of Book One, where I think I bring in drawing upon the mists too early in the series without enough foreshadowing. That said, I'm not planning to revise it, even if we do a 10th anniversary edition like with Elantris. 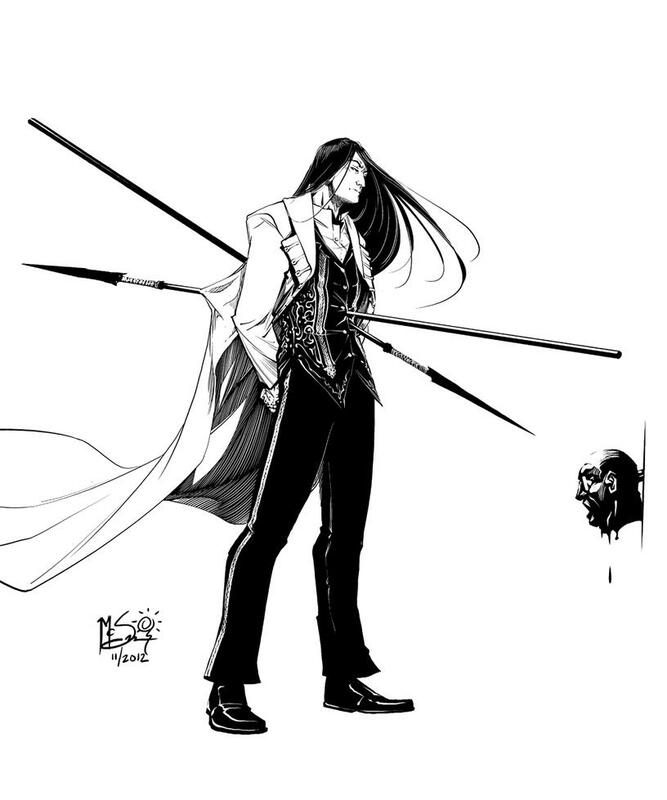 The problems with Elantris created continuity issues; the problem with Mistborn is more of an artistic choice, making it similar to the problem in WoR. The difference here is that I'm still working on Stormlight, so it is considered to be an open book in my head--while Mistborn is done, and it's time to leave it alone. We're moving in the story, timewise, much more quickly here than we were at the beginning of the book. Often there will be a week or so between chapters. It's kind of hard to tell in my books, as I don't talk very often about time passing. That's not one of my things; my books tend to feel very compressed, as if they happen over the course of a few days. However, each of the Mistborn books has covered many months—the first one covered almost an entire year. The nature of the Final Empire, where it tends to have very mild winters, makes the changing of seasons rough to follow. It really depends on the book. If you want to know the inspiration for the Mistborn books, you can google Sanderson's First Law. It's an essay I wrote about how I came up with the magic system. That'll help you see where some of the ideas came from and how I take them and use them. What about The Stormlight Archive? Stormlight, the original inspiration was the storm of Jupiter. The big storm that rotates around Jupiter, and I wanted to do something that had a perpetual storm like that. In the first book the group is focused on getting control of the palace and is not worried about the return of the army because they think that if they get the palace they'll have the atium and, thus, the ability to pay for the loyalty of the army, since they're mercenaries. Well they didn't find the atium, right? So no ability to pay the old army for their loyalty. I'm just saying that it seems to me that the absence of the Lord Ruler's army supporting the city should be a huge indication to all the other warlords that the atium isn't in Elend's possession. People have been saying that he wouldn't have anyone to trade with so the atium would be worthless but he would have had a year to work out trade with someone if he wanted to monetize it (with as valuable as atium is made out to be in the first book he would have found someone wanting to buy some even if he couldn't get the price the Lord Ruler charged for it). Ah! Well, that makes sense. I certainly think some people in world might have come to this conclusion. But they'd still think the atium must be somewhere in the city, even if Elend doesn't have/isn't spending it. However, I think the issue is a little less cut and dry. For one thing, Elend DOES have the loyalty of much of the local army--the garrison serves him now, which would be an indication that he has access to some of the Lord Ruler's resources. I don't think the lack of a larger army would be an indication he doesn't have the atium, however. Let's say you were a small band, and were able to seize and control Ft Knox, and get the guards stationed there to serve you. The president is dead, and the country is fragmenting into city-states. A senator from a nearby state might easily round up the military in his area, promise them that he's the new civil authority--then push them to go seize the gold. When they arrived, they wouldn't think, "Why is their force so small? They must not actually have the gold." They'd think, "They're ripe for the picking. We got here first." That's basically what is happening. The "Lord Ruler's Army" doesn't exist any more--it's fragmented, taken over by various groups who ruled their own local regions. And the bulk of the most frightening part, the koloss, are their own uncertain band. The answer is yes, I planned it from the beginning. And I didn't. It's difficult for me, even as the author, to trace back when and where the various threads of a story began. I wrote all three of these books in a row, and to me, they're one long story. Yes, I chose three distinct segments of time over the five-year span, and separated out those chunks. But it's all part of a whole, which is why it was so important for me to be able to write this series as one singular book. So, if I go back to my very first notes, will it include a discussion of Sazed becoming God and using the stories in his metalminds as guidelines for remaking the world? No, I don't think it's there. Just like Kelsier wasn't originally planning to create a rebellion through his sacrifice, just like Vin wasn't even originally female. Things change and grow with a book as you write it. However, let me say that I knew early in the series that I wanted Sazed to end up as the Hero of Ages and ascend with the power. I felt it was the only way to deal with the world ending and have it start anew. Plus, he's the only one who really deserved it, as he was the only one of the characters who ever cared much about religion. I kept this in mind while revising the first book, as I'd finished the rough draft of book three by that time. I planned how to use his religions and feature them in the novels in a way that would show off their finer qualities. In a way, this is my compromise. As I've said, I don't believe in the "spokes on the wheel" theory. Not every religion can be true, if only because they—logically—disagree on so many points. But every one of them can teach things that are true. This is something I actually believe. And, like many of my beliefs, it ended up influencing how I wrote this book. How about the general number of years Warbreaker is from [The Hero of Ages] and [The Alloy of Law/The Way of Kings]? RAFO - the reason that timeline questions are being RAFOed right now is because the final times are still not 100% solid, and Brandon said that he doesn't want to give us a time and then have it change around again (like what happened to [The Alloy of Law] being moved to the same time as [The Way of Kings] instead of being a bit earlier), so he won't answer any timeline questions until after he has the final timeline correct in his own system. How much research, if any, went into the making of the Mistborn trilogy? I did quite a bit, mostly reading about the era of the industrial revolution, alongside researching alchemy and eunuchs.